Sandia Prep’s Engineering & Coding classes begin in the 8th grade and continue through senior year. 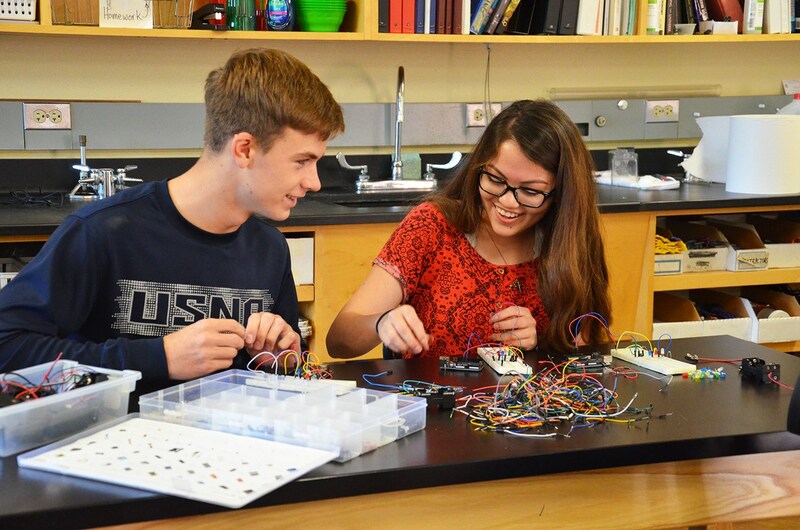 Students build on a foundation of engineering concepts and basic coding taught in 8th grade and progress to mechatronics and longer, more complex strings of code. This course focuses on the engineering process and allows students to get an introduction to engineering, programming, and robotics. Students get an introduction to computer programming in NetLogo and use new skills to create programs capable of doing complex calculations and simulations. Students engage in an exploration of mechanical systems and fabrication. Students problem-solving skills are then put to the test by using Lego Mindstorms to develop and program systems to solve complex problems. Have you ever built a gaming computer from scratch? Do your parents hide all expensive electronics when you enter the room with a screwdriver and smile? Does your room have scorch marks on the floor? Want to learn how to fling a pumpkin across a muddy field? Then this is the class for you! This course provides an introduction to the design, fabrication, and testing process followed by all engineers. Students gain these engineering skills by completing a variety of projects like building bridges, remote controlled cars, and other projects. Projects introduce basic mechanical construction techniques necessary to be a successful engineer. Students use computer-aided design programs (AutoCAD) to design each piece needed for their designs and then fabricate prototypes and final designs using AutoCAM, 3D Printers, CNC Routers, and printed circuit board makers. The final step is to assemble and test designs. The course is meant to instill the engineering design process and the need for iterative design. This course provides an integration of computer programming and engineering with a focus on the use of engineering principles as a guide. Projects allow students to learn how to create mechanical and electrical systems that use computer programming to adapt and react to surroundings. Students further develop concepts of 3D Modeling and Printing to create more substantial models and to better understand the application of the engineering process. While improving upon manufacturing techniques, students use sophisticated tools to create more complicated and intricate systems that intertwine mechanical and electrical systems to solve real-world engineering problems. Completion of projects reinforces and develop abilities to make informed design decisions. This course also reinforces the ideas behind documentation of work using an engineering notebook and other report writing. This course introduces students to the basic components of programming in Java and gives students the tools to write computer programs of their own. Instruction begins with logical reasoning, clarity, and organization of thought. Computer programming assignments will emphasize mastery of variables, types, conditionals, loops, functions, arrays, and more. Readability, debugging, formatting, and organization will be emphasized throughout the course. Students immerse themselves in more challenging problems and learn more complex programming constructs in the Java Programming Language. CS 2 begins with a study of control flow, followed by principles of Object Oriented Programming. Students design larger programs than in previous courses, necessitating organization, clarity of thought, and a renewed emphasis on clear commenting. CS 2 students are also introduced to more advanced data structures and theory of computation.